Alexandre Dumas, fils (Paris 27 July 1824 – 27 November 1895) the illegitimate son of Marie-Laure-Catherine Labay, a dressmaker. The above list is quite impressive. The descendants of French marquis Antoine Davy de la Pailleterie, a colonel and général commissaire in the artillery of the colony, include a famous general who played a significant role in Napoleon’s early military victories, between 1795 and 1799, the Directoire FR period of French history, or the first Republic. However, Thomas-Alexandre lived at a very difficulty time in the history of France, Revolutionary France. 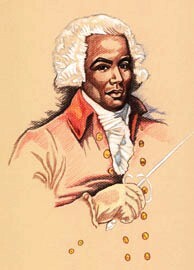 So did Joseph Boulogne, chevalier de Saint-George, the “black Mozart,” a swordsman, an equestrian and Thomas-Alexandre’s life-long friend. They were members of the aristocracy, yet could ill-afford to oppose the notion of equality promoted in Revolutionary France. The two were mulattos, born to freed slaves in the Carribeans: Saint-Domingue (the current Haiti) with respect to Thomas-Alexandre (25 March 1762,- 26 February 1806) and Guadeloupe, in the case of Joseph Boulogne, chevalier de Saint-George (approximately 1745 – 1799). Both would be in the military during Revolutionary France and would do so as aristocrats. Just how Joseph Boulogne became an aristocrat is not entirely clear in my mind. His father Georges Bologne was ennobled in 1757 and, after completing his studies, Joseph Boulogne was appointed Gendarme de la Garde du Roi (Gendarme of the King’s Guard). In fact, Georges Bologne may have been the descendant of Italian aristocrats, but Joseph was born out-of-wedlock. Be that as it may, Thomas-Alexandre, was born to an aristocrat, marquis Antoine Davy de la Pailleterie. Antoine had joined his brother Charles, in Saint-Domingue, but he disappeared probably to escape his creditors. He took three slaves with him and started to live under a pseudonym: Alexandre Delisle. He sold his three slaves so he could buy a small sugar plantation at Jérémie, Saint-Domingue and then purchased “for an exorbitant price,” black slave Marie-Césette (Dumas). Marie-Césette was not a mulâtresse. [i] It appears she was from Gabón and is the mother of three children: two sons and a daughter or two daughters and a son, by Antoine. Sources differ. But a fourth child, a daughter, was also born to Marie-Césette, or Cessette[ii] before she was bought. Thomas-Alexandre and his sisters were sold, with an option to be bought back or the “right of redemption.” This sort of transaction was called à réméré. Antoine-Alexandre Davy de la Pailleterie became rich as a slave-trader and also sold various properties in France. He therefore repurchased Thomas-Alexandre who lived in France. The name Dumas means “from the farm,” but the name could be Dûma,[iii] a name originating from an ethnic group called Fang. Thomas-Alexandre adopted his mother’s surname and it became the name of his very famous son, Alexandre Dumas, père (father) and grandson, Alexandre Dumas, fils (son). Both were very popular writers who were elected to the Académie française. The most famous Dumas, Alexandre Dumas, père had three illegimate children, one of whom is Alexandre Dumas, fils, born to Marie-Laure-Catherine Labay, a dressmaker. Dumas, fils, was an illegitimate child. He is the author of La Dame aux Camélias, or The Lady of the Camellias. Antoine was presumed dead and his brother Charles had returned to France, playing Marquis. However, Antoine also returned to France and reclaimed his real identity, that of Antoine Alexandre Davy de la Pailleterie. That story was fictionalized as The Count of Monte-Cristo (1944), by Dumas, père and his ghost writer Auguste Maquet. Auguste Maquet also co-wrote The Three Musketeers (1844). Getting money out of Saint-Domingue was difficult and therefore perfect material for Dumas, père, a passionate writer. The Three Musketeers features d’Artagnan who arrested Nicolas Fouquet. It would appear that marquis Antoine Alexandre Davy de la Pailleterie returned to France in c. 1775 and died at Saint-Germain-en-Laye, in 1786, just short of the French Revolution (1789 – 1796). He had bought back his son Thomas-Alexandre who met the above-mentioned mulatto and aristocrat Joseph Boulogne, chevalier de Saint-George (25 December 1745 – 10 June 1799) when both studied under fencing master La Boëssière, at La Boëssière’s Academy. That friendship ended with the death of Saint-George who did not find employment after the Revolution and was weakened by a two-year stay in a jail. He may have died of gangrene. Thomas-Alexandre also served in Egypt where he had a verbal disagreement with Napoleon Bonaparte himself. He therefore left on an unsafe ship and was taken prisoner in the Kingdom of Naples and thrown in a dungeon where he was imprisoned from 1799 to 1802. When he was released, Thomas-Alexandre “was partially paralyzed, almost blind in one eye, had been deaf in one ear but recovered; his physique was broken.”A broken gentleman, Thomas-Alexandre, fathered Alexandre Dumas, père (born 1802) on his return to Villers-Cotterêts. However, Thomas-Alexandre was sick and he was poor, and Napoleon Bonaparte did not help him. He died of a stomach cancer in February of 1806. The Dumas story is a success story. Antoine Davy de la Pailleterie had a gifted and prominent son, and equally accomplished grandson and great-grandson. In fact, there would be more prominent descendants of Antoine Davy de la Pailleterie and Marie-Cessette Dumas. However, our mulatto heroes, the Chevalier de Saint-George and Thomas-Alexandre Dumas were victims. One was the victim of the French Revolution, the other, Thomas-Alexandre, the victim of a heartless Napoleon Bonaparte. Bonaparte did not have a conscience. The Black Count: Glory, Revolution and Betrayal, and the Real Count of Monte Cristo, by Tom Reiss. This biography earned Mr Reiss the 2013 Pulitzer Prize for Biography or Autobiography. [ii] Reports vary concerning Marie Céseste or Cessette. Some biographers and historians claim she was of mixed ancestry. Some also claim she was not married to Antoine Davy de la Pailleterie. Antoine Alexandre did sell his family à réméré, i.e. with an option to buy then back but he did not claim Marie-Cessette back. It may be that she had died of dysentery c 1772 to 1774.